The world’s oldest profession presents considerable challenges to an artist. Selling the body has a long history in art but in the past it has sometimes been alluded to subtly with a wink and a nudge. Visual codes were employed by artists like Jan Steen whose ‘The Interior of an Inn’ acts as a prologue to ‘Hoerengracht’ an installation by Ed and Nancy Kienholz made during the 1980s exhibited at the National Gallery. Steen depicts three men lewdly leering at a serving girl in a 17th century Inn. One grabs her dress while she lays her hand on his arm. Is it to reproach him or indicate that there are some ground rules to be observed? Another suggestively fills a long pipe with tobacco. But ‘Hoerengracht’ relies less on suggestion and more on full disclosure of the game of arousal and illusion employed by prostitution to lure punters into a snare. By adding one letter to ‘Herrengracht’ the artists translate the name of one of the city’s best addresses into ‘Whore’s Canal’ in Dutch, a simulation of a district notorious for its honest marketing of women’s bodies. The Kienholz’s worked jointly on a project that took 5 years of labour to simulate the observed details of Amsterdam’s red light district and its working conditions. Using casts of real bodies, the Kienholz’s stage an uncanny simulation of prostitutes at work. There is no disguised allusion here as the visitor enters a murky, mocked up street scene faintly illuminated by red light bulbs and partially revealed rooms. Women loosely dressed for their trade either stand alert beckoning to potential street trade or appear languidly bored reading magazines or listening to the radio to pass the time of day. This installation plays with the revelation and discretion employed by prostitution. 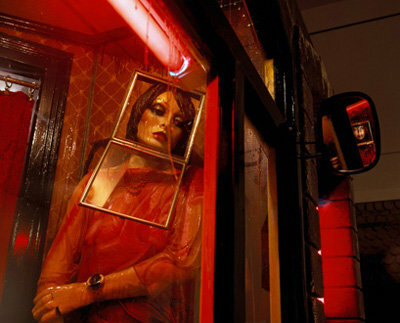 One disembodied head floats within a tiny window frame while around a sharp corner a woman sits slumped in stockings and underwear. Each mannequin is finished with clear resin that runs down the figure suggesting both tears and the glossy surface of seduction. Their faces are framed by cigar boxes, which imply the commodification of their bodies. ‘Hoerengracht’ is characteristic of other installations made by Ed and Nancy Kienholz that deliberately entrap us in a voyeuristic complicity. As the visitor wanders through this uncannily accurate re-enactment, we become participants in a game of hide and seek, drawn by the hunt for flashes of their bodies and faces performing in tiny spaces as stage sets for fantasy. Obscure but necessary details of domestic life intrude, ashtrays, grimy sinks and drying laundry which capture the banal details of long pauses between the main event. This is yet another variant of show-business and these grotty waiting rooms bear a strong resemblance to backstage dressing rooms of West End theatres. But what this meticulously observant work fundamentally pleads for is a generous acceptance of the world’s oldest profession and a understanding of its rituals.